Savannah Culpepper, Other, F, U , B, 20, GA/GA/GA, Farm Hand. Maggie B. Simms, Niece, F, Oct 1898 (1), S, GA/GA/GA. Alex S. Culpepper and Annie Fullbright, W, 16 Apr 1914, Fulton Co., GA, Book U-206. A. S. Culpepper, d. 25 Apr 1940 at 62 years in Fulton Co., GA.
Martha E. Culpepper, 1, F, GA.
Stephen Culpepper and Elizabeth J. Richey on 14 Jul 1846 in Jones Co., GA.
Steve D. Culpepper, Head, M, Dec 1855, 44, Sng, GA/GA/NC, Day Laborer. Stephen D. Culpepper, 16 Dec 1855 - 21 Jul 1913. Jane Culpepper, 1, F, GA.
Thomas Culpepper, 8, M, GA.
Jones Co., GA Will Book E 1865-1914. Hardy Jackson, Other, M, S, 22, GA/GA/GA, Farm Laborer. Jones Co., GA Marriages. Source Unknown. "Mattie Culpepper and Joel J. Wright, 15 Jul 1870, Jones Co., GA."
"Martha J. Culpepper and Walter Watts, 24 Dec 1878, Jones Co., GA."
"Amanda Culpepper and Wilkins Gresham Jr., 30 Dec 1879, Jones Co., GA."
George Culpepper's mother, Mary Culpepper, was shown as divorced in the 1880 census. The identity of George's father is uncertain, but a George W. Culpepper was named as a grandson in the 1879 will of Stephen M. Culpepper. Stephen M. Culpepper was the son of Robert Culpepper and his first wife, Pheriba Wright. Pheriba died when Stephen was only about four years old. Circa 1819, when Stephen was about eight, Robert married second, Jane. In the 1830 census in Columbia Co., Stephen and his brother George Washington Culpepper, are likely the males age 15-20 who are living with Jane. Jane was enumerated again in Columbia Co. in 1840 and then in Richmond Co. in 1850. Stephen has not been found in the 1840 census, but in 1850, 1860 and 1870 he was enumerated as a head of household in Jones Co. The most likely child of Stephen to be the father of George is the oldest son, William R. Culpepper, born circa 1853. George Culpepper, Other, M, Sng, W, 6, GA/GA/GA, --. "Lucy Culpepper and Little W. Hammons, 30 Dec 1879, Jones Co., GA."
"Lucy Culpepper and John Long, 17 Jul 1890, Jones Co., GA."
John T. Culpepper, Head, M, Feb 1864, 36, Sng, GA/GA/NC, Sawmill Woodsman. Floyd Co. Deeds, Book ?, Page 412, 17 Apr 1852. Daniel Culpepper and Winney Frances on 3 Jun 1853 in Floyd Co., GA.
Amanda Culpepper, 3, F, GA.
Joseph Culpepper, 8, M, GA.
John Culpepper, Son, M, Aug 1855, 44, Sng, GA/GA/GA, Tax Receiver. E-mail written Nov 2007 to Warren Culpepper from Cynthia Stansell Janus (gd/o #57832), e-mail address. Compiled by Maxine Culpepper Barron of Rainsville, AL and sent to Culpepper Connections in 1999 by Lilly Hammond. Emanuel Joseph (Joe) Culpepper was the great-grandfather of Metta Maxine Culpepper Barron. Emanuel Joseph Culpepper was born July 4. 1824, in Georgia. He married Pamelia Ann Phillips, who was born in Georgia on August 29,1828. They lived in Georgia until 1852 or later. They are listed in 1860 census of Jackson County, Alabama on p. III, post office Straight Creek. There were no Culpeppers, listed in the Jackson County, Alabama earlier. Emanuel Joseph Culpepper died May 30, 1889. Pamelia Ann died April 15, 1899. They are both buried at Old Antioch cemetery, in DeKalb County, Alabama, between Fyffe and Section, Al. On County Road ?. We have been told that Emanuel Joseph's parents lived with him in Alabama for a while, but can find no records of this. Pamelia Ann was a school teacher, Mr. Culpepper was listed as a laborer and as a farmer. Mr. Culpepper 's sons all were granted land in their name from the General Land Office of the U. S. A. , in or around 1862. The amount that they each received was 159.09 acres. The law stated that they had to homestead less than 160 acres. These records are in the Federal Office Building, in Huntsville, Al. Mr. Culpepper's girls also homesteaded this amount of land in their husband's names. I have a opy of the application for William Monty Culpepper's land. There is an riginal copy of this, in our family. The Culpepper land all joined at ne time, and was known as the "Culpepper Community", in Jackson County, AL The area was served by the post office known as Tally, in 1890. It is said that Emanuel Joseph Culpepper was a Union Army sympathizer, but this was not proven. He did serve in the Army. Mrs. Culpepper had a brother, 17 years old, who was killed in the war. There is quite a story about this. He is buried in an unmarked grave at Old Sardis Cemetery in Jackson Co. Hagwood Cemetery was named after a man named Hagwood, who was trying to recruit men for the Union Army, was hanged and buried "on the spot". Stories were told in the family of several or seven Culpepper boys and two or three of their married sisters and their families getting separated as they traveled "South" The girls names were lost, but it is believed that this is where the tie comes with the Culpeppers on Lookout Mountain, and around Fort Payne and Center, Alabama. 1. Wisenna J. (female) born 1852 in Georgia. 2. William Monty Culpepper, born July 28,1854, in Alabama. Married Eliza Ann Adlada Riddle around 1883. William Monty died of "pneumonic fever" on June 1, 1908. Mrs. Culpepper was known as "Aunt Lade" was born October 1, 1861 in DeKalb Co., Alabama. She died February 26, 1947. They are buried at Old Antioch Cemetery between Fyffe and Section. This is the great grandparents of Metta Maxine Culpepper Barron. 3. Sarah A. (female) born 1857 in Alabama. 4. 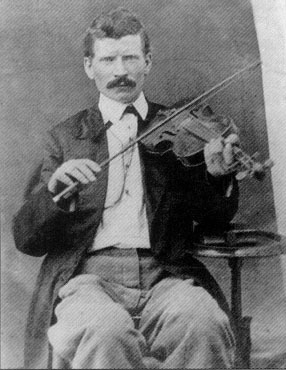 Jesse Lonnie Culpepper, born November 26,1859. 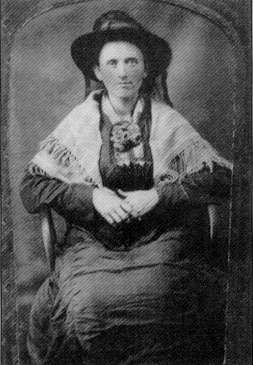 Married Mary Hannah, born 1852. Mr. Culpepper died February 22,1935 and Mrs. Culpepper died 1933. They are buried at Hagwood Cemetery in Jackson Co., Alabama. Mr. Culpepper married Liza Moss the second time. They had one girl. Of the first marriage there were 3 girls and one boy (Dr. King Europe Culpepper). 5. Lucinda A. "Sindey" Culpepper, born March 15,1861, died November 1, 1940 ; married James Anderson. She is buried at Old Antioch Cemetery. He is buried at Hagwood. 6. Columbus Frank "Lum" Culpepper, born January 4,1862, died June 14, 1916. Married Mary A. Morton, born June 12,1867, died February 11, 1954. They are buried at Old Antioch Cemetery. The 1860 Census of Jackson County says "Lum" was born 1864. 8. Knott (spelled Notty on census) Culpepper was born April 15,1869, died May 1928. Census of Jackson Co. 1860 says be was born 1872. He moved to Texas, died in Oklahoma. 9. Rosa Culpepper, born August 13,1871, died November 6,1936. Married William Case Clayton, born Sept. 16,1875, died August 16, 1928. They are buried at Trinity Methodist Church Cemetery in Rainsville. E-mail written Apr 2006 to Warren Culpepper from Gwen C. Maxwell, e-mail address. As of 29 Apr 2006, owner of the original picture of Emanuel and Pamela Culpepper. Biography* � Pamelia was a school teacher. While the tombstone for Pamelia Ann Phillips Culpepper says she died 15 Apr 1899, she appeared in the 1900 census, taken 1 Jun 1900. So she is assumed to have died after the date of the census. (Appears as Jessie L. in the 1910 census. However, according to a 30 Sep 1999 letter from Flora Barrier to Warren L. Culpepper, his name was Jessey Leondis (Lonnie) Culpepper. Maxine Barron, in her 2004 book, Culpepper, said his name was Jessie Leonidas. ED 31, sheet 13, Jessie L. age 51, wife Mary J. age 57. 1840 Census 1 Jun 1840� Frances was probably a free white female, age 10 and under 15, in Dickinson Culpepper of Warren Co., GA's household, on the 1840 Census on 1 Jun 1840 at Warren Co., Georgia. Frances Culpepper and Washington Rees on 20 Apr 1842 in Warren Co., GA.
1840 Census 1 Jun 1840� Larkin was probably a free white male, age 20 and under 30, in Dickinson Culpepper of Warren Co., GA's household, on the 1840 Census on 1 Jun 1840 at Warren Co., Georgia. Larkin Culpepper and Nancy Alford on 30 Dec 1841 in Warren Co., GA.
1840 Census* 1 Jun 1840� Washington was listed as the head of a family on the 1840 Census on 1 Jun 1840 at Wilkes Co., Georgia. William G. Culpepper, 48th GA Inf., no dates. Civil War* between 1861 and 1864� John Culpepper of Quitman Co, GA enlisted on 15 Aug 1861 as a Private and mustered into Co. F, GA 61st Infantry. He was wounded 27 Jun 1864 at Cold Harbor, VA and died in the Hospital. Biography* � John was living near Washington Culpepper, in both 1850 and 1860, and as a result, had once been assumed to be a brother of Washington. However, DNA testing shows John Henry to be a descendant of Joseph Culpepper of Edgecombe Co., NC, and thus not a brother of Washington and not a descendant of Robert Culpepper, Jr. According to a descendant, Frank Sanders Ziegele of Lakeland, FL9, John died of illness on a march through Virginia during the Civil War. He served in Co. F of the 61st GA Infantry. 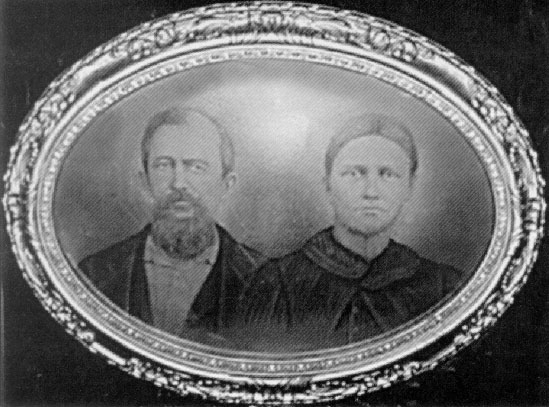 John H. Culpepper and Elizabeth W. Gray on 23 Dec 1852 in Early Co., GA.
+ Josephine Culpepper, 15 Nov 1860 - 6 Feb 1955. Mary F. Culpepper, 1, F, GA. The National Park Service, compiler, Civil War Soldiers & Sailors System, The National Park Service.